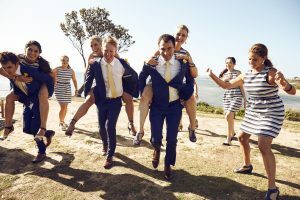 When they were kids, Jack and Jill went up a hill to fetch a pale of water; now that they’re adults they’re throwing the ultimate wedding bachelor party! As one of the best things to come out of weddings since Princess Di’s marshmallow dress, a Jack and Jill party is the new way to exit your single days in style, writes April Davis. Gone are the days of girls-only parties and alcohol fuelled encounters with strippers that, let’s face it, are rarely as attractive as they looked through your beer (or cocktail) goggles. Thanks to the prevalence of Jack and Jill parties, you can cut your pre-wedding planning efforts in half! Double the fun and half the effort! Throwing a gender-neutral bachelor party is a smart move for couples. Especially those who need to save a bit of cash in the lead-up to their big day. We’re exploring this fun new trend to see if it’s all it’s cracked up to be. Spoiler alert, it is! So, what is a Jack and Jill party? Essentially, it’s an event that combines the efforts of the bridal shower, hens night and bucks night into one fun-filled package. Forget about wedding politics! With a gender-neutral fiesta, you can invite whoever you like, as the party won’t be girl or boy specific. Invites don’t need to be limited to your wedding guest list; a Jack and Jill party is the ultimate way to celebrate your pending nuptials with everyone – not just your closest friends and family. The other great part about this particular type of co-ed bash is its fundraising potential. These parties are designed to raise some much needed funds for couples. This is done by charging an entrance or ticket fee – no more than $10 to $15. This may make some couples uncomfortable as asking your friends and family for money can be tricky. The average hens and bucks bachelor party come with a lot of upfront costs that guests are expected to pay. Rather than spending $100 on strippers and booze, your guests will only pay a small entrance fee for a night of fun. So, essentially, you throw a bachelor party, raise some cash to pay for your wedding, and have a great time. It’s a win/win for everyone! Now that we know there’s money involved, it’s worth looking at the best ways to approach the financial side of your Jack and Jill party. Firstly, you’ll need to make sure your party is worth the ticket price. A muddy backyard with a few sausages in bread might not cut it. While an extravagant night of glitz and glamour will negate your fundraising efforts. SO plan for the weather, get some decorations and supply enough food for everyone. That way, your guests will be more than happy to purchase a ticket. As well as planning a worthwhile bachelor party, you’ll need to tell your guests about the ticket price up front. It’s not pleasant to show up on the night and be unexpectedly asked for some cash! When you send out the invites, include a sweet little note or poem – much like you would for a wishing well – informing your guests of the entrance fee. Also, mention that the money will go towards paying for your wedding. This might be unfamiliar territory for some – especially your Grandma. But, once your guests understand the concept, they will be more than happy to help out. After you sort out the semantics of your bachelor party, it’s time for the fun part – the planning! To make your celebration a night to remember, get creative – without overdoing it – and plan, plan, plan! From scavenger hunts to afternoon picnics, dinner parties to a Great Gatsby style bachelor party, your celebration can be low-key or elaborate. Before you choose the style of your event, think about who you will be inviting. Traditionally a hens or bucks night would come with an 18 plus guest list. Which makes drinking and debauchery more than acceptable. However, if your celebration is combining the hens, bucks and bridal shower, you might want to invite your Grandma and little sister. If you want a family friendly event, a playful scavenger hunt or picnic could be the way to go. While if you’re keeping the guest list strictly adults, a party that goes until all hours of the morning could be more fitting. As this is a fundraising event, don’t forget to be a thoughtful host! Supply finger food or a meal, have plenty of drinks and don’t skimp on the entertainment. Depending on the size of your event you may only need a few plates of sausage rolls and party pies and a sound system. Or you might need to supply a range of canapés and hire a jukebox or DJ. While pre-wedding events are all the rage and a lot of fun, make sure you don’t overdo it. A Jack and Jill party is a great way to replace your bridal shower. Perhaps even the engagement party. So try to avoid overwhelming your guests with celebrations, especially if you have the same guest list for each event. A good general rule is to have a maximum of two pre-wedding events; this is enough to get people in the wedding spirit, without overwhelming them. Your final fling before the ring should be a memorable occasion. What’s more memorable than spending a fun-filled evening with your fiancé and nearest and dearest? Skip the gender-specific party and raise some much needed funds for a Jack and Jill party instead – no strippers required!